As experienced sellers know, the world of Amazon is constantly changing. But one thing remains constant: the FEES! It’s easy to get fixated on all the charges, but there’s no reason to let Amazon fees keep you from running a successful Amazon FBA business! It’s not like the fees are a problem in and of themselves. The fees are actually a reasonable cost of doing business with Amazon. And with our favorite sourcing methods, there’s plenty of room for both Amazon fees and PROFIT. But here’s where I see Amazon sellers get tripped up: they don’t understand the different types of fees and then they’re surprised when those fees are deducted from their selling price. You score a great deal on a Hot Wheels set….but didn’t realize that you’d have to ship it all by itself to a warehouse that handles Oversized items. And once it arrives? It’s subject to extra FBA Fees! It’s ok to own up to fee confusion. Let’s be honest, there are a LOT of different fees. Some fees are per-item while others are monthly. And then Amazon mixes things up by charging different fees for the same items depending on what month it is! Enough! Stop pulling your hair out! Instead of being overwhelmed by Amazon selling fees, make sure you know what fees to expect before you send an item to Amazon. There's no excuse not to know your fees because Amazon offers a free tool that will calculate your fees (and profit!) before you ever send in an item. And you can use the free FBA Calculator from the comfort of your own desk. How Much Does Amazon Charge in Fees? Selling your items on Amazon gives you access to their massive platform and hundreds of millions of customers. And if you’re an FBA seller, Amazon even processes, packs, and ships your orders to customers. Oh, and they deal with customer service! So it’s no surprise that this service isn’t free. Amazon collects payment from third-party sellers in the form of fees. Amazon charges a variety of fees. Some are monthly and consistent. Some are per-item. And others are only for special circumstances. But to run a profitable business as an Amazon seller, you need to know exactly what fees will be deducted from your gross sales. Let’s face it, if you don’t understand the Amazon fees, you run the risk of losing money. Amazon has their fees scattered in a handful of places in Seller Central. For fees related to selling on Amazon, you can read the Selling on Amazon Fee Schedule. 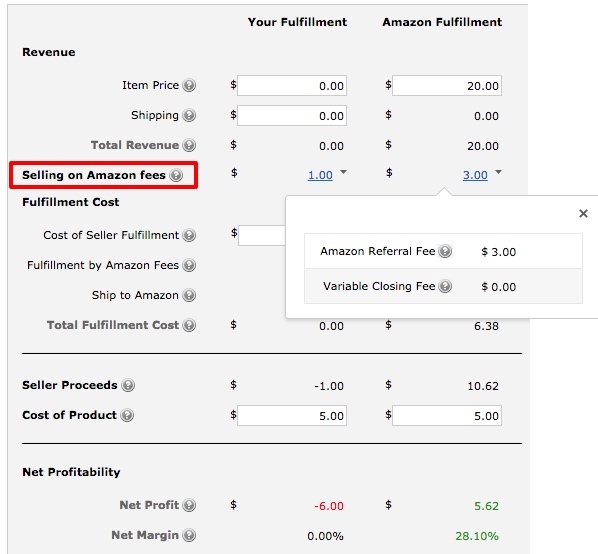 For Fulfillment by Amazon fees, you head to the FBA fulfillment fees page. So, technically, you could study up on all the fees and do the math on every item you want to buy….but that’s no fun (and would be very time consuming)! Or, on the other end of the spectrum, you could guesstimate that selling fees are approximately one-third of the selling price. But that could get you into trouble if your estimate is wrong. What you really need is to know the exact fees that will be applied on a per-item basis. Because once you know your planned selling price, your cost, and your Amazon fees, you know your expected profit. 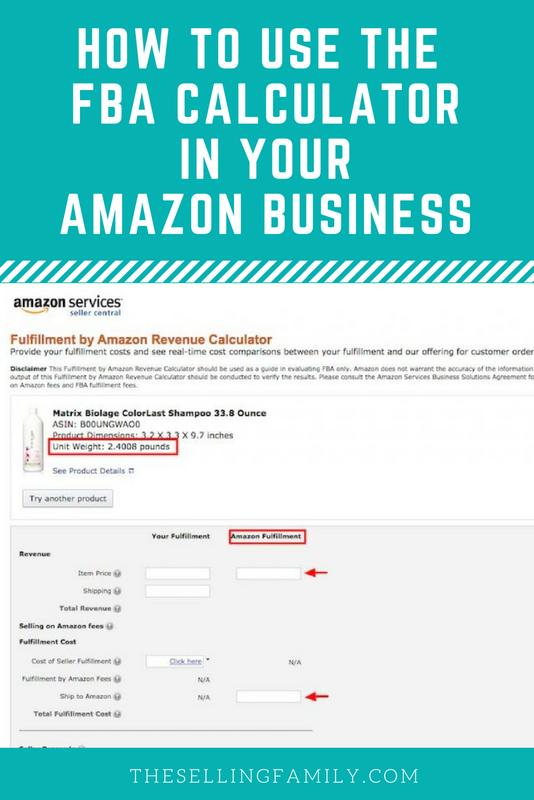 Luckily, Amazon has a Fulfillment by Amazon Revenue Calculator to do all the work for you! Let's go ahead and take the FBA Calculator for a test drive. Here's what you see when you first load the page. It’s mostly greyed out because you have to enter an ASIN into the search bar before you can do anything else. If you don’t know the ASIN, you can always search for a product by name. Once you’ve picked a product, the rest of the page loads. At the top, you’ll see the product’s name, ASIN, dimensions, and weight. I’ve highlighted the weight here because you’ll need that info later. Because we're using Amazon's FBA service, we’re only interested in the second column: “Amazon Fulfillment.”* You’ll fill out the 3 empty boxes and then press “Calculate” to get the results. *You can use the “Your Fulfillment” column to check the fees for Merchant Fulfilling (FBM) the same item. 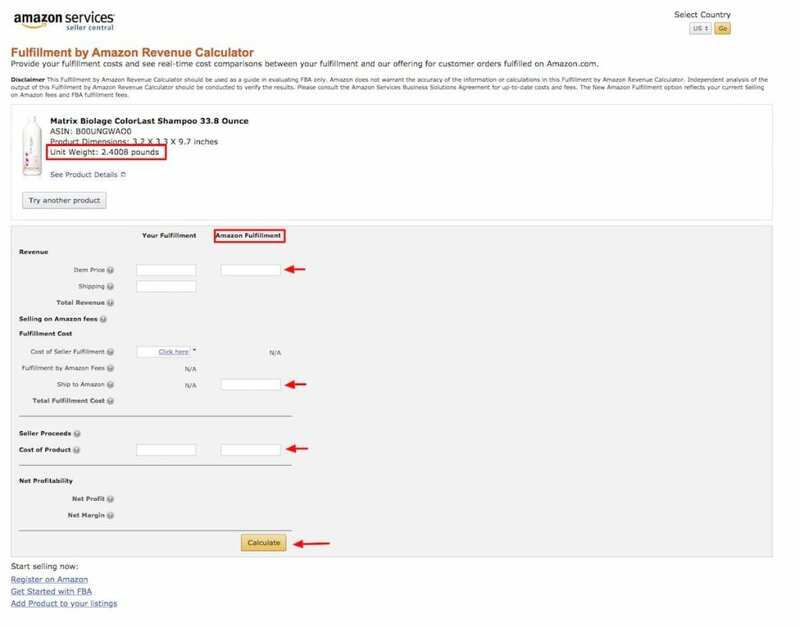 If you do both columns, Amazon will display a revenue comparison of the 2 fulfilllment methods. But for this blog post, we're just concerned with FBA fees. Item Price: Enter the price that you plan on selling the item for. If you need some help deciding, you can click the “See Product Details” link which will take you to the Amazon product page. You can check out the current Buy Box price or see how other FBA sellers have priced the item. Ship to Amazon: Amazon wants you to estimate how much it will cost to ship this item to one of their fulfillment centers. Because we don’t know the exact price until we create the shipment, we have to make an estimate based on the weight. I recommend using $0.50 per pound as your shipping estimate. That means you have to do a little bit of math to fill out this field. Because the item in this example weighs about 2.5 pounds, I’m going to enter $1.25 as my “Ship to Amazon” cost. Cost of Product: Here you simply enter how much you paid for your item. This price has nothing to do with Amazon fees, but Amazon needs to know this information to show you your net profit. Alright, let’s hit calculate and see what happens! So I entered $20 for my item price, $1.25 for my “Ship to Amazon,” and $5 for my cost. Amazon does the math and shows me that my expected profit is $5.62. This shows that the entire $3.00 selling fee on this product is the referral fee. If you click on the arrow next to the $5.13 “Fulfillment by Amazon Fees” you get a similar popup box. So most of our FBA Fees are the actual Fulfillment Fees ($5.09). The rest is one month’s storage fee of $0.04. Alright, we just saw a lot of different fees by working our way through the FBA Calculator. I’m going to briefly explain what they are. This is the primary “Amazon Selling Fee.” Amazon collects the Referral Fee in exchange for listing your item on the website. Both FBA and Merchant Fulfilled sellers are charged a Referral Fee. The Referral Fee is a percentage of your selling price. The percentage varies by category, but for most categories, it is 15% of the selling price (or a $1 flat fee, whichever is higher). In our Beauty product example, we were charged 15% of the $20 selling price ($3.00). If you want to see the different fees for categories, you can view them all in the Selling on Amazon Fee Schedule. 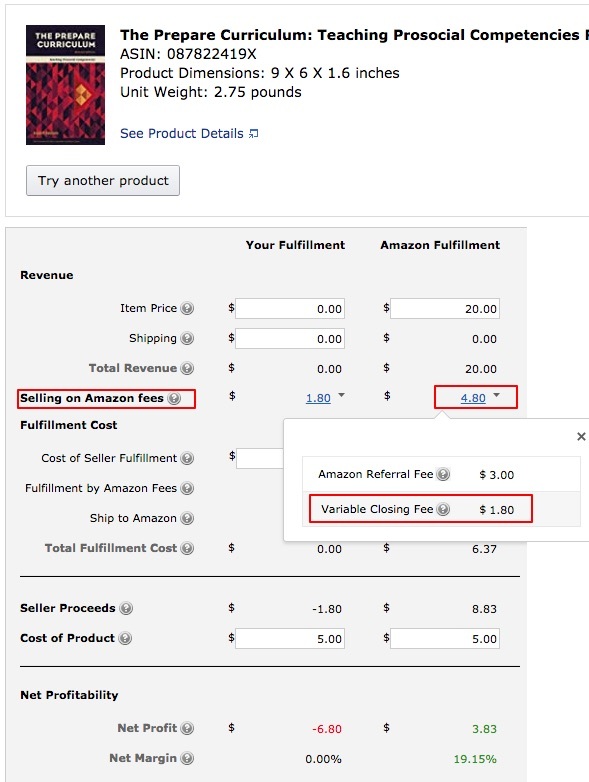 The second “Amazon Selling Fee” is the Variable Closing Fee. Our Beauty product had a $0.00 variable closing fee, and that’s because the Variable Closing Fee only applies to a few categories. The Variable Closing Fee is a flat fee of $1.80 per media item that is sold. Amazon defines media categories as Books, DVD, Music, Software & Computer/Video Games, Video, and Video Game Consoles. Just so you can see it on the FBA Calculator, here is a $20 niche textbook that has both a Referral Fee and a Variable Closing Fee. Like the Referral Fee, the Closing fee is for both FBM and FBA sellers. 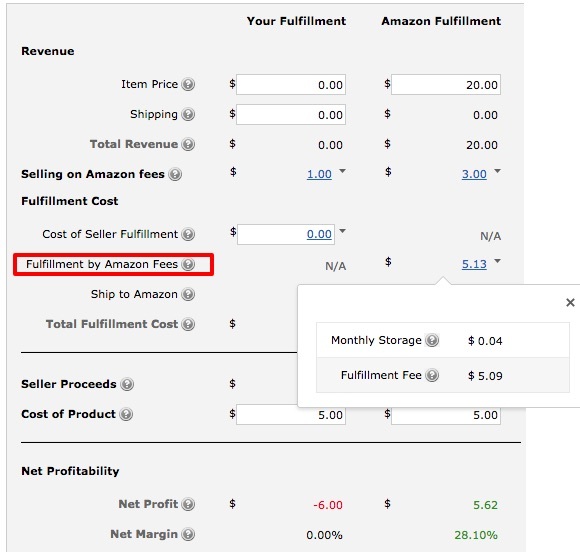 In the breakdown of the Fulfillment by Amazon fees, Amazon first shows the Monthly Storage fee. The price shown in the FBA Calculator is for a single month’s storage fees. If your item sits in a warehouse for longer than one month, you’ll continue to accumulate storage fees. Amazon does not want their warehouses being used to store slow-moving items, so they charge a per-item fee that encourages sellers to ship in items that will sell quickly. The Monthly Storage Fee varies by product size (in cubic feet), product tier (standard vs oversize), and month. Amazon charges a higher fee during their busiest months of the year (October - December, aka Q4). Unlike the other fees in the FBA Calculator, this one does not come out of the selling price of your item. Your monthly storage fees are assessed once a month. The fee is typically charged between the 7th and 15th day of the month following the month for which the fee applies. (For example, your July monthly storage fees would be deducted from your account sometime between August 7 and August 15). The main FBA fee is the Fulfillment Fee. This fee is calculated based on a product’s weight and product tier. Amazon offers a lot of information about this fee on the FBA Fulfillment Fee page. 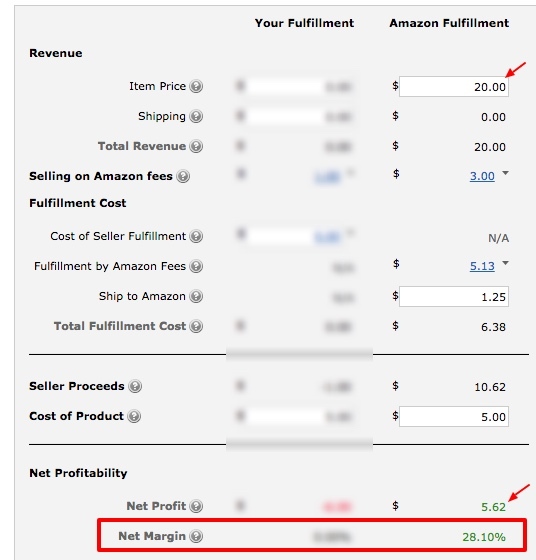 Right below your Profit, Amazon shows you one more thing: Net Margin (also called Profit Margin). Your Net Margin is your Net Profit divided by your Selling Price. At The Selling Family, we’re generally discussing an item’s ROI (Return on Investment) instead of its Profit Margins. ROI and Profit Margins are both good ways to analyze profitable products. So the FBA Calculator has already showed us that our Profit Margin ($5.62 ÷ $20.00) is 28.10%. If you want to manually calculate an item’s ROI, you need to know the Cost of Product and the Net Profit. It’s up to you if you prefer to think in terms of ROI or Profit Margins. But you need to know your Net Profit to do either calculation, and that’s why the FBA Calculator comes in handy! Now just to be clear, this isn’t every fee that Amazon can or does charge. But the FBA Calculator does show every fee that is deducted from your selling price per item. The fees in the calculator should match the fees that are deducted from your gross sales. The primary reason to use the FBA Calculator is to know your profit so that you can make smart buying decisions. But you might have noticed that this would be a little awkward to use if you’re out doing Retail Arbitrage in stores. You can’t exactly bust out your laptop in the middle of a crowded Walmart! So if you’re doing some Retail Arbitrage, you’ll be relying on a scanning app to calculate your profit for you. The free Amazon Seller app will do all of the same calculations for you, it just happens to be a little more convenient to use your phone when you’re out and about. For more information about calculating profit on the go, read my review of the top 2 Amazon scanning apps. 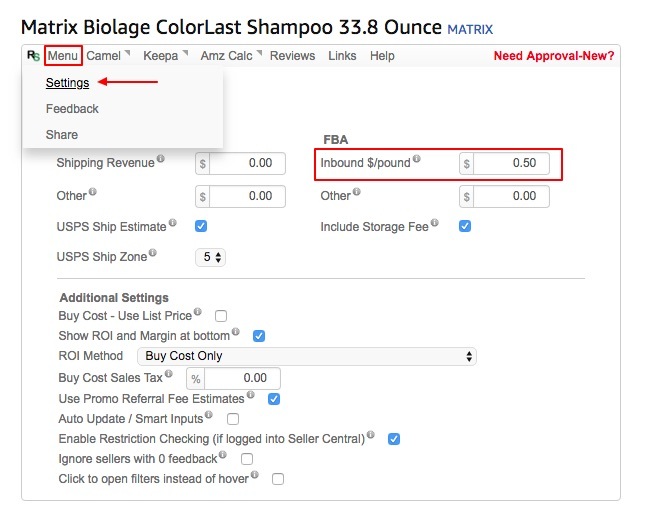 Online Arbitrage: When you’re doing OA, you’ll need a way to check the fees on the products you find. You're already on your computer, so why not keep the FBA Calculator open in a separate window? BOLO Groups: If you’re a member of a BOLO group, you might want to research the products before you go out to the store to make sure they meet your profit requirements. Private Label and Wholesale: Before you make a big investment in a Private Label or Wholesale product, you want to absolutely make sure you know the fees and profit! Research: Sometimes I browse the sales ads online before I go to the store. This way if I see that an item is on sale at Target for 50% off this week, I can go ahead and use the FBA Calculator to check the profit and fees. If you’re like me and already keep too many tabs open, you’re probably thinking that opening up the FBA Calculator to manually check all your items isn’t very efficient. I happen to agree and find that it slows down my sourcing. The good news is that there’s a Chrome extension that does all of the FBA fee calculations (plus a few cool extra things!) for you. It’s called RevSeller, and once it’s installed in your Chrome browser, it calculates your profit for you right on the product page. 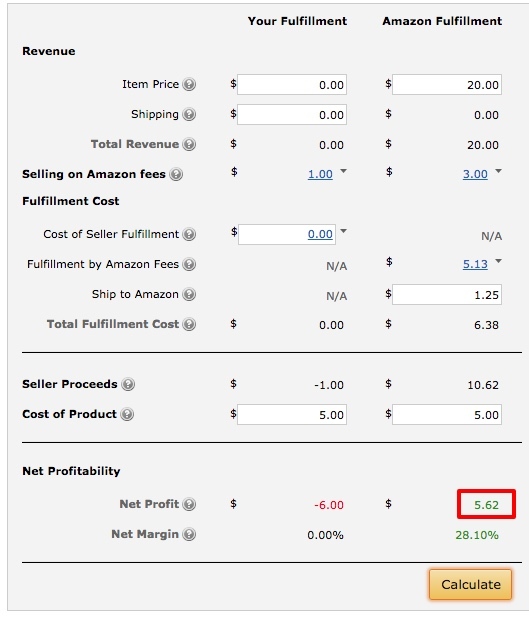 This saves you the steps of opening the FBA Calculator in a new window, entering the price, and calculating the shipping estimate. 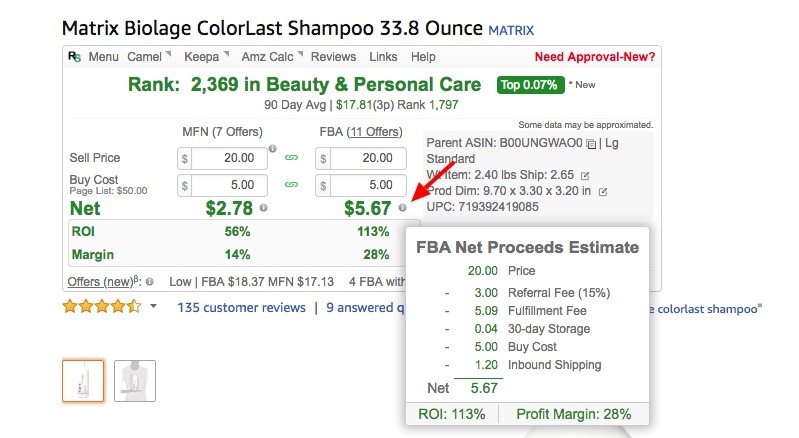 Here’s the same shampoo bottle we looked at in the FBA Calculator. With the RevSeller Extension installed, this loads automatically when I go to the product page! All I did was enter my $20 selling price and $5 buy cost. You can see that it instantly calculated the Net Profit, ROI, and Margin. I really like that this one also shows ROI because that’s how I analyze my profits. Note: you do need to go into the Menu Settings to enter a per pound shipping estimate to Amazon. As always, I used $0.50. Now if you want to see all of the individual fees that we discussed earlier, just click on the “info” icon next to your Net Profit. And there you have the exact same fees that we saw in the FBA Calculator! (Ok, I know the Inbound Shipping (and therefore the Net Profit) is off by $0.05. That’s actually because RevSeller made a more accurate Inbound Shipping calculation than I did). Basically, it shows you all the info you need at a glance which makes it a HUGE time saver. 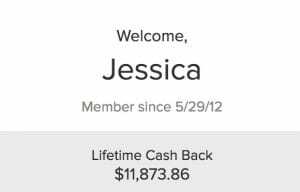 If you want to try it out, RevSeller comes with a 30-day free trial (no credit card required and you get full access right away). If you stick around after the trial, it’s $99/year. Sign up here to start your free 30-days. You must have a Professional Seller plan with Amazon to use RevSeller. If you are on the Individual Selling plan, you can’t use this extension. RevSeller is currently only available for the Chrome browser. But because of all the great Chrome extensions out there for us Amazon sellers, I really recommend that you use Chrome anyway. RevSeller does not work on mobile versions of Chrome (again, you would use a scanning app if you were on your phone or tablet). RevSeller can only be used for one Selling account, but it can be installed on multiple computers. When you sign up for the free 30-day trial of RevSeller, you’ll get full instructions on how to install RevSeller. It’s a really simple process and there are very detailed instructions. I hope you now realize just how important it is to understand Amazon fees so that you can know your profit. Scanning apps, the FBA Calculator, and RevSeller are all great tools that make this process easy. You don't have to take the time to read all of the fee breakdown pages on Seller Central, but DO make the time to calculate your profit before you buy. So, what do you think? Are you going to give FBA Calculator or RevSeller a try? 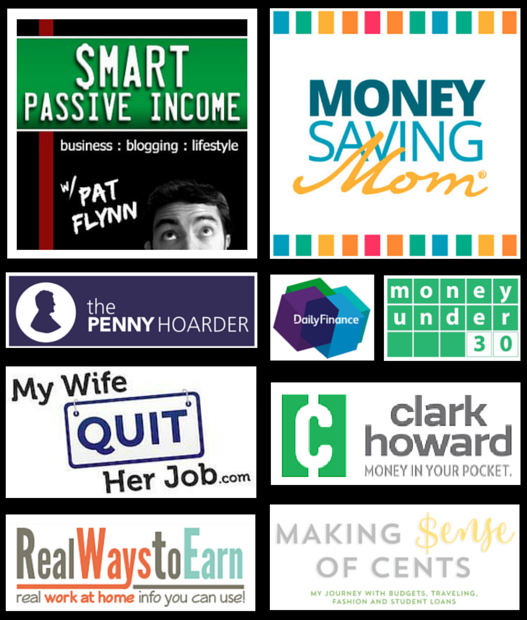 If you're doing any Online Arbitrage, Private Label, or Wholesale, these are must-use tools. If you have any questions about Amazon fees, drop them in the comments below! Very detailed guide for someone to understand FBA calculator. One thing I would like to highlight that these FBA charges are EXCLUDING any taxes so consider that too. Thanks Jessica, as always great valuable information and Free! I’m love RevSeller, I can’t do online arbitrage without RevSeller. Although I’m familiar with almost all of this, I ALWAYS read your posts. I really wish they were more frequent. Thanks for the great work! Thanks Ken! We are working on getting more posts out more consistently 🙂 Let me know if you have anything specific you want us to write about!